Judge Mary Joan Berenato was appointed to the 8th Judicial County Court bench on June 3, 2013. Before her appointment as a County Court Judge, Judge Berenato served as a District Court Magistrate in the 8th Judicial District for ten years. During her tenure as a Magistrate, Judge Berenato presided over matters in the Juvenile Court , the Juvenile Drug Court, the Dependency and Neglect Court and the Domestic Relations Court. In 2007, Judge Berenato was named Outstanding Judicial Officer of the Year for the 8th Judicial District and for the State of Colorado. 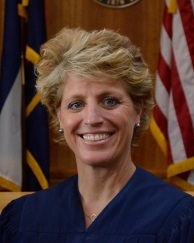 Judge Berenato received her Juris Doctorate from Temple University in 1990 and received her Bachelor of Arts from Colorado State University in 1986.